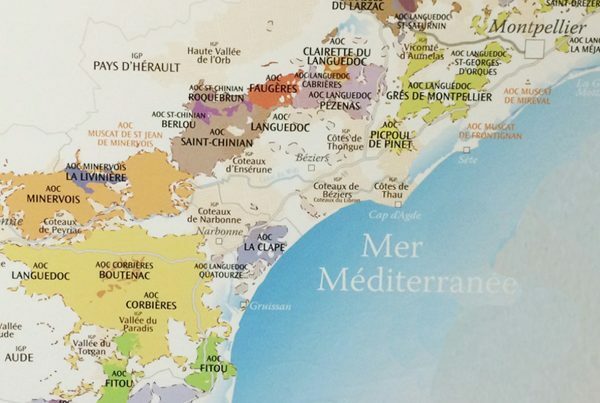 As one of the very largest wine regions in the world, you cannot visit Languedoc without doing a wine tasting. But it might be a bit difficult to decide which estate (or estates) you want to go to as you can choose from more than 21,000 domaines (!). Last week I visited the charming Château de Perdiguier in Maraussan. This castle has been around since the 13th century and surprisingly enough grows more than just vines. Time to find out more. The setting of Château de Perdiguier is gorgeous. Right on the banks of the Orb river, I drove up the driveway of the castle, flanked by rows of bright green vineyards, where Pauline and Kate welcomed me. 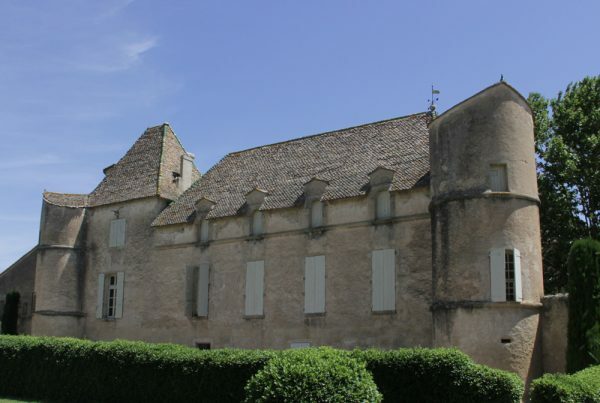 Initially built as a Bastide in 1280, Château de Perdiguier became the property of the King of France in 1375. Charles V then gave it to his treasurer Jean Perdiguier, hence the name of the castle. Since 1968, Château de Perdiguier is in hands of the Feracci family. 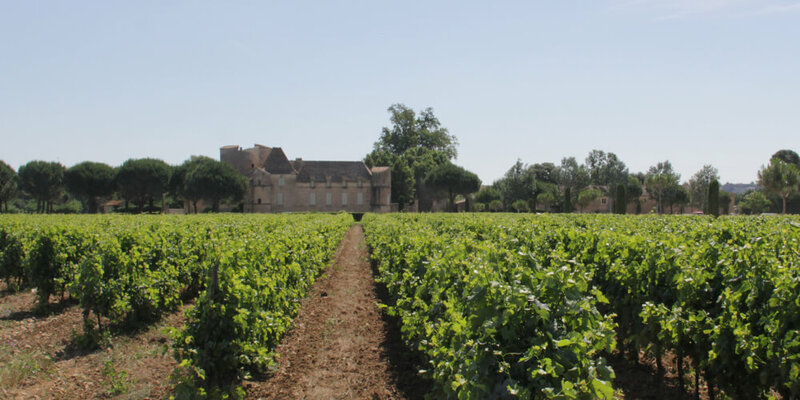 They have set up a flourishing wine estate under the IGP French wine quality category, which is less strict than AOC. That is why today you will also find grape varieties less used in Languedoc, like merlot and cabernet sauvignon. I was curious to know why roses were planted at the end of some vine rows. Kate explained to me that roses act like an early warning system, as some of the typical vine diseases hit the roses before they hit the vines. Interesting way of avoiding pesticides! The third generation of the Feracci family does not only grow vineyards. 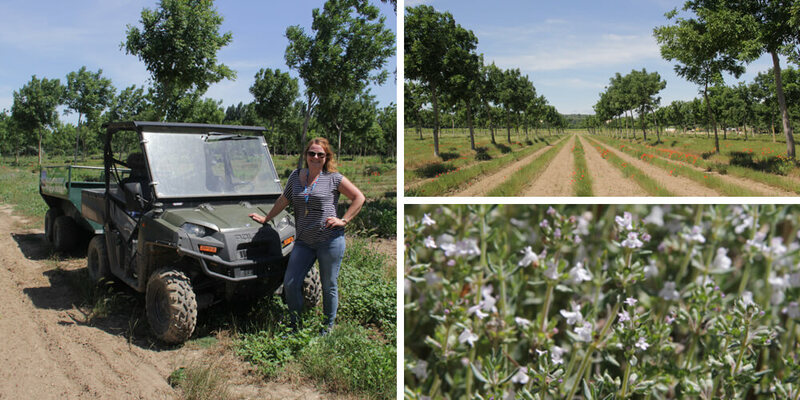 When hopping on the domaine’s trailer, I found out all about agroforestry and aromatic herbs. It was fascinating to see all these perfectly aligned trees. According to Kate, the trees are planted with the newest technology, using satellites to get them this straight. Agroforestry is all about using land in a smart, ecological and dynamic way. That is why you will see other crops planted between the trees. On the 26 hectares of cultivated land behind the castle, the family have planted aromatic herbs like thyme and oregano. But there is more: in total 800 hectares have been planted with various crops. Once back at Château de Perdiguier, I had a private tour of the castle. The Feracci family still lives in the castle, so we couldn’t see it all. But Kate did show me this fantastic hidden treasure in one of the towers. 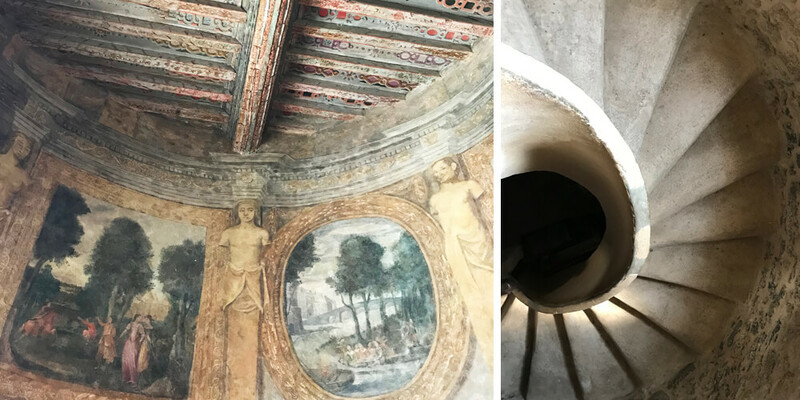 A couple of years ago, the family discovered, by accident, some amazing 17th-century frescos. Finally, I ended my visit with a gourmet tasting including wine, cheese, charcuterie and other local specialities. Utterly satisfied, I headed back home, happy to have found a great new location I’d love to bring my family and friends to. 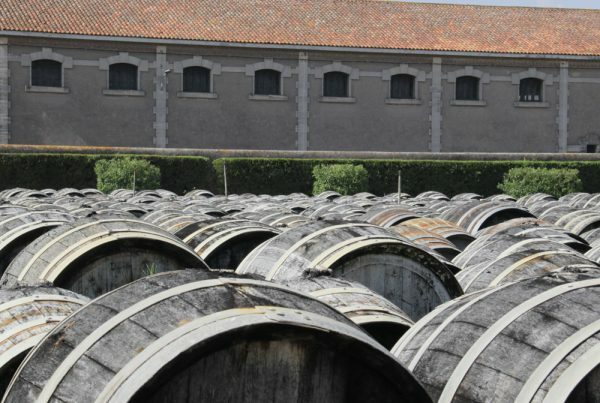 The Château de Perdiguier winery is open all year round. 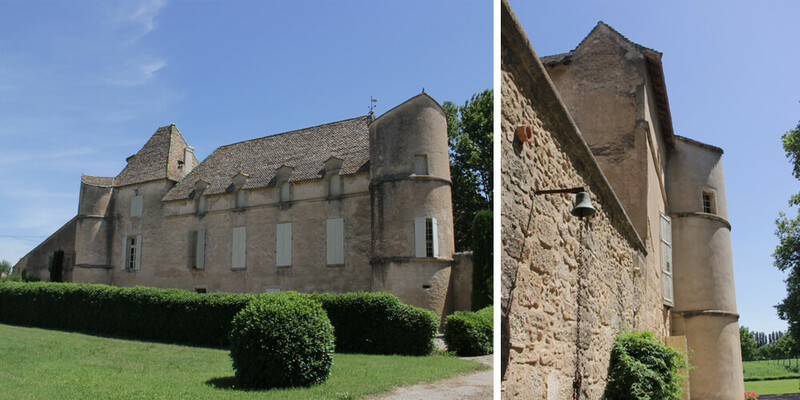 Guided tours in French or English can be organised (6 euros per adult) by reservation if you want to be sure, or on site. 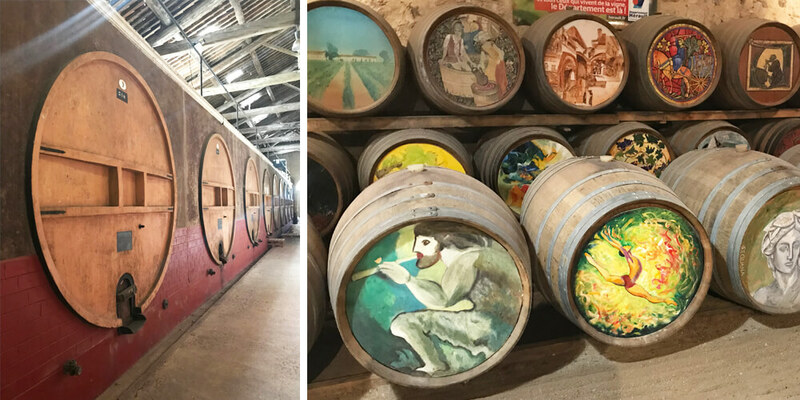 You can choose between a tour of the castle or an aromatic tour in agroforestry, both followed by a wine tasting in the cellar. 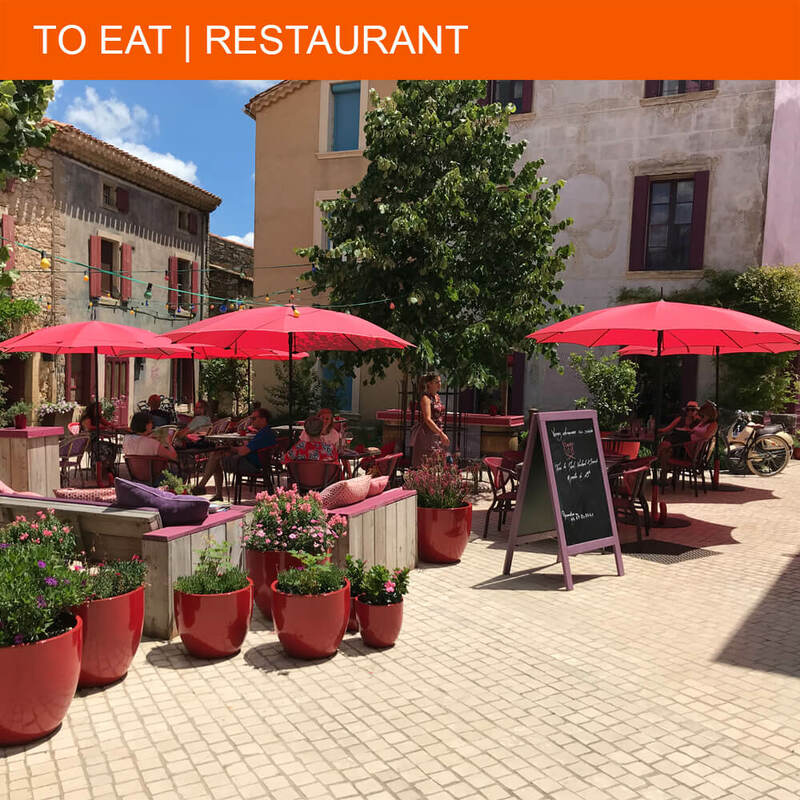 For 20 euros per person, you can do a gourmet tasting. More information can be found on their website.